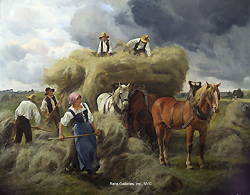 This Belgian 19th century artist specialized in rustic genre scenes featuring peasants working in the field or tending to their animal. While little is know about his formal artistic training, it is obvious that his style and choice of subject matter were based closely on the works of the French Realist artists Julien Dupré (1851-1910) and Georges Laugée (b.1853). 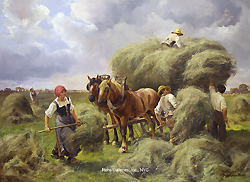 Joseph Julien would often feature his figures hard at work in the field, lifting heavy forks of mown wheat or grass onto large horse-drawn carts. His figures are full of action and his skies are often cloud filled --- adding to the feeling of movement within his canvas.